Going into an unfamiliar place and interacting with unfamiliar people can be a scary experience for any young child – even though it is a necessary part of early visits to the doctor. To help children in the community become more accustomed to a medical checkup in a delightfully engaging way, Washington County Community College [WCCC] coordinates a Teddy Bear Clinic every year. This year’s Teddy Bear Clinic, held on Tuesday, March 26th, brought approximately 50 children into the college to participate in the event. Every child received a teddy bear that became both their newest companion and their charge as they walked it around the Medical Assisting lab to receive a series of common tests from Medical Assisting students. “The children are the caregiver of their bear and have the opportunity to become familiar with the medical equipment and setting,” explains Cindy Moholland, Medical Assisting Program Director. 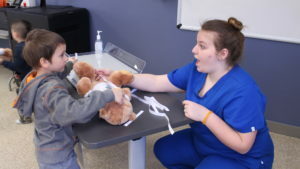 Along with enabling the children to become more familiar with doctors and the kinds of treatment they can expect when they themselves need a checkup, the WCCC Teddy Bear Clinic gives Medical Assisting students time with the youngest of their future patients. “The Medical Assisting students gain experience in communicating with children in a healthcare setting,” Moholland elaborates.